Bundtzen, Thomas K.; Nokleberg, Warren J.; Price, Raymond A.; Scholl, David W.; Stone, David B.; Price, Raymond A. Price, R.A., How the Solid Earth Works, 2017, in Nokleberg, W.J., ed., Dynamic Geology of the Northern Cordillera (Alaska and Western Canada) and Adjacent Marine Areas: Tectonics, Hazards, and Resources: University of Alaska ScholarWorks@UA, 65 p.
Diedrich, Tamara; Fix, Paul; Foster, Andrea L.
Bundtzen, Thomas K.; Nokleberg, Warren J.; Price, Raymond A.; Scholl, David W.; Stone, David B.; Nokleberg, Warren J.; Stone, David B.
Nokleberg, W.J., and Stone, D.B., 2017, Natural Hazards and Tectonics, in Nokleberg, W.J., ed., Dynamic Geology of the Northern Cordillera (Alaska and Western Canada) and Adjacent Marine Areas: Tectonics, Hazards, and Resources: University of Alaska ScholarWorks@UA, 117 p.
Miller, D.M., 2017, The late Cenozoic Eastern California Shear Zone after 25 years of study, in Reynolds, R.E., ed., Revisiting the Eastern California Shear Zone: California State University, Fullerton, Desert Studies Consortium, p. 45-54. Hagstrum, Jonathan T.; Firestone, Richard B.; West, Allen; Weaver, James C.; Bunch, Ted E.
Hagstrum, JT, Firestone, RB, West, A, Weaver, JC, and Bunch, TE (2017) Impact-related microspherules in Late Pleistocene Alaskan and Yukon “muck” deposits signify recurrent episodes of catastrophic emplacement. Scientific Reports 7:16620, DOI: 10.1038/s41598-017-16958-2. Moore, Thomas E.; Gautier, D.L. ; Gautier, Donald L.; Moore, Thomas E.
Gautier, D.L., and Moore, T.E., 2017, Introduction to the 2008 Circum-Arctic Resource Appraisal (CARA) professional paper, chap. 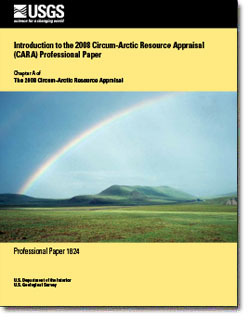 A of Moore, T.E., and Gautier, D.L., eds., The 2008 Circum-Arctic Resource Appraisal: U.S. Geological Survey Professional Paper 1824, 9 p., https://doi.org/10.3133/pp1824A. 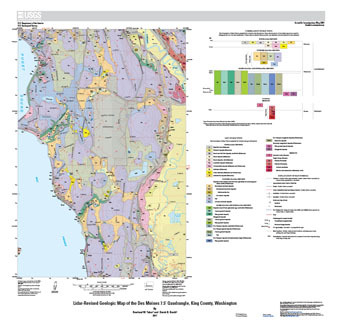 Tabor, Rowland W.; Booth, Derek B.
Tabor, R.W., and Booth, D.B., 2017, Lidar-revised geologic map of the Des Moines 7.5' quadrangle, King County, Washington: U.S. Geological Survey Scientific Investigations Map 3384, 17 p., 1 sheet, scale 1:24,000, https://doi.org/10.3133/sim3384. Bundtzen, Thomas K.; Nokleberg, Warren J.; Price, Raymond A.; Scholl, David W.; Stone, David B.; Nokleberg, Warren J.; Price, Raymond A.
Bundtzen, Thomas K.; Nokleberg, Warren J.; Price, Raymond A.; Scholl, David W.; Stone, David B.; Nokleberg, Warren J.
Nokleberg, W.J., 2017, Introduction to E-Book on Dynamic Geology of the Northern Cordillera (Alaska and Western Canada) and Adjacent Marine Areas: Tectonics, Hazards, and Resources, in Nokleberg, W.J., ed., Dynamic Geology of the Northern Cordillera (Alaska and Western Canada) and Adjacent Marine Areas: Tectonics, Hazards, and Resources: University of Alaska ScholarWorks@UA, 18 p.
Bundtzen, Thomas K.; Nokleberg, Warren J.; Price, Raymond A.; Scholl, David W.; Stone, David B.; Nokleberg, Warren J.; Scholl, David; Bundtzen, Thomas K.; Stone, David B.
Nokleberg, W.J., Bundtzen, T.K., Scholl, D.W., and Stone, D.B., 2017, Landscapes and Seascapes and Tectonics, in Nokleberg, W.J., ed., Dynamic Geology of the Northern Cordillera (Alaska and Western Canada) and Adjacent Marine Areas: Tectonics, Hazards, and Resources: University of Alaska ScholarWorks@UA, 59 p.
Marine geology and tectonics--What is under all that water? This chapter is divided into two main sections. The first section is on Marine Geology Seascapes (what earth scientists call bathymetry). The second section is on Tectonics of Marine Areas. Bundtzen, Thomas K.; Nokleberg, Warren J.; Price, Raymond A.; Scholl, David W.; Stone, David B.; Scholl, David W.; Nokleberg, Warren J. Primary Commodity Uses: Copper is used primarily in electronics, mostly in building construction and industrial electronics. Primary Commodity Uses: Chromium mostly goes into stainless steel and other alloys, as well as in color pigments. When can ice yield fire? That’s the burning question at the heart of one of USGS’s longest-running research programs to date: the exploration of gas hydrates. Eureka often accompanies this EarthWord. It is difficult to overstate the importance of energy to the American economy. Managing this vital sector depends on knowing how many energy resources we have, how many we use and need, and how these resources are transported. The Dnieper-Donets Basin of Ukraine could contain an estimated 4.3 billion tons of undiscovered potassium-bearing salt according to a recent U.S. Geological Survey assessment. In addition, previous estimates show that the nearby Pripyat Basin of Belarus could contain 80–200 billion metric tons of undiscovered potash resources.